As an artist I have committed my life to my craft. I stared at a very young age taking art lessons from professional artist. Painting in oils ,watercolors, acrylics, colored pencils, airbrush, silkscreen printing, Linoleum prints, copper engraving, and copper etchings. Drawing using graphite, silver point, pastels, and charcoal. I have a B.F.A. from Texas A&M in Kingsville, Texas. 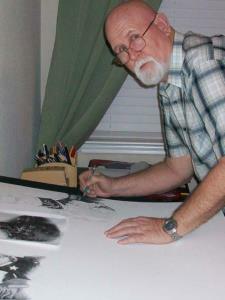 I started my professional career as an Illustrator in the United States Air Force during the Viet Nam war.